The Harlem Hellfighters | Your #1 Source for Kindle eBooks from the Amazon Kindle Store! In 1919, the 369th infantry regiment marched home triumphantly from World War I. They had spent more time in combat than any other American unit, never losing a foot of ground to the enemy, or a man to capture, and winning countless decorations. Though they returned as heroes, this African American unit faced tremendous discrimination, even from their own government. The Harlem Hellfighters, as the Germans called them, fought courageously on—and off—the battlefield to make Europe, and America, safe for democracy. 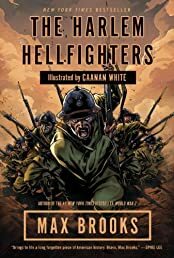 In THE HARLEM HELLFIGHTERS, bestselling author Max Brooks and acclaimed illustrator Caanan White bring this history to life. From the enlistment lines in Harlem to the training camp at Spartanburg, South Carolina, to the trenches in France, they tell the heroic story of the 369th in an action-packed and powerful tale of honor and heart. I first learned of the Harlem Hellfighters from an Anglo-Rhodesian named Michael Furmanovsky when I was 11. Michael was working for my parents while getting his MFA in history from UCLA. He taught me about the British Empire, the Falklands War, Hiroshima, the Holocaust, and a host of other topics not covered in my fifth-grade western civilization class. Of all his after-school lessons, the one that left the deepest impression was the story of a unit of American soldiers who weren’t allowed to fight for their country because of the color of their skin. To a white, privileged kid growing up on the west side of L.A. in the 1980s, that kind of prejudice was just inconceivable. When I confessed that I didn’t know about them, he assured me that I wasn’t alone. Ten years later I was an exchange student at the University of the Virgin Islands. The experience brought me back into the orbit of the Hellfighters when, while walking through an old cemetery, I noticed some graves from 1918. I wondered if they might be casualties of the Great War, maybe even members of the 369th. I decided to ask my professor of Virgin Islands history. He was an African-American from the mainland, and to call him passionate would be a laughable understatement. With his beard and spectacles and flaring dashiki, he would rail against the historical crimes committed by white men of Europe and North America. Most heinous was the erasure of black accomplishments by white historians. Colonization, he would tell us, begins with the mind, and the best (or worst) way to colonize a people is to bury their past. “There were no black soldiers in World War I.” That was his dismissive answer to my question about the graves from 1918. When I started to argue, even bringing up the name “Harlem Hellfighters,” he assured me that I must have been confused with the Tuskegee Airmen of World War II. I was shocked. Here was a scholar, a crusader, a thoughtful, driven man who’d made it his life’s mission to trumpet the glory of Africa and her diaspora, and HE didn’t know about the Harlem Hellfighters. I wish I could say that I decided then and there to write their story, but that would have to wait for nearly another decade. In the late 1990s, I was living back in L.A., just out of graduate school and trying to make a living as a writer. My decision to tackle the story of the Hellfighters came after watching two TNT made-for-TV movies about the Tuskegee Airmen and the Buffalo soldiers. I thought TNT might be interested in a story about World War I’s black heroes, especially after A&E’s successful Lost Battalion movie. I started collecting books about the subject (the most influential was and still is From Harlem to the Rhine by Arthur Little), and a year and several dozen drafts later, I pitched my screenplay to the TNT Network. They passed. So did everyone else. Things changed when I sent my script to actor/director LeVar Burton. “There are actually more than a couple Harlem Hellfighters scripts floating around Hollywood,” he told me during our meeting, “but yours comes closest to the truth.” He agreed that the subject matter would be difficult to sell to studios, but that by no means should that deter me. “I don’t have the power right now to make this movie,” he said, “but I’m not going to give up, and you shouldn’t either.” Thank you, Mr. Burton. Five years and what seemed like a lifetime later, an unexpected opportunity opened up in the world of comic books. In 2006, I began collaborating with Avatar Press on a graphic companion to my first book, The Zombie Survival Guide. I learned very quickly how different comic book writing was from prose, but how similar it could be to movie scripts. I also realized that comics presented a forum for telling very visual stories without the cumbersome budget of movies or television. It seemed the ideal medium for telling the story of the Harlem Hellfighters. It’s now been close to six years since I began working with William Christensen of Avatar Press and the amazingly talented artist Caanan White. And now it’s time to share this heroic regiment’s story of courage, honor, and heart with you. I hope that you are as captivated by it as I have been.